I remember as a very young child opening the big freezer in the dark, unfinished back room in our basement on the night before Easter and discovering trays and trays of peanut butter eggs filling the ice-encrusted shelves. Some of the eggs were dipped in chocolate, some were plain, and I vaguely remember something coconut as well. I rushed up the creaking stairs to tell my parents about my find, and my dad went back down to the basement and brought back one egg for each of us. I remember coming to expect finding those eggs in our freezer each Easter, as if somehow they too were delivered by a rabbit, only to open the freezer one Saturday night before Easter and discover that they weren't there. That year, my dad made them on Easter day. My dad has been making these peanut butter eggs for Easter for years and they are as much a part of our Easter tradition as taking pictures in front of our 22 year old cherry blossom trees (that moved with us to our new house when we did), putting rabbit ears on the dogs, and dying eggs. This year I made the peanut butter eggs. I tried my best to shape them into a nice egg shape (if I had a deviled egg tray, that would have been great), but this is certainly a treat that tastes better than it looks. I didn't dip mine in chocolate because I'm not a huge fan of peanut butter and chocolate together (for some reason peanut butter and chocolate are unbelievably good separately, but taste weird together). They would be much prettier dipped in chocolate or drizzled with chocolate, but they taste divine just how they are. Beat together peanut butter, cream cheese, and butter until creamy. Add salt and 1/2 teaspoon vanilla. Mix in powdered sugar. 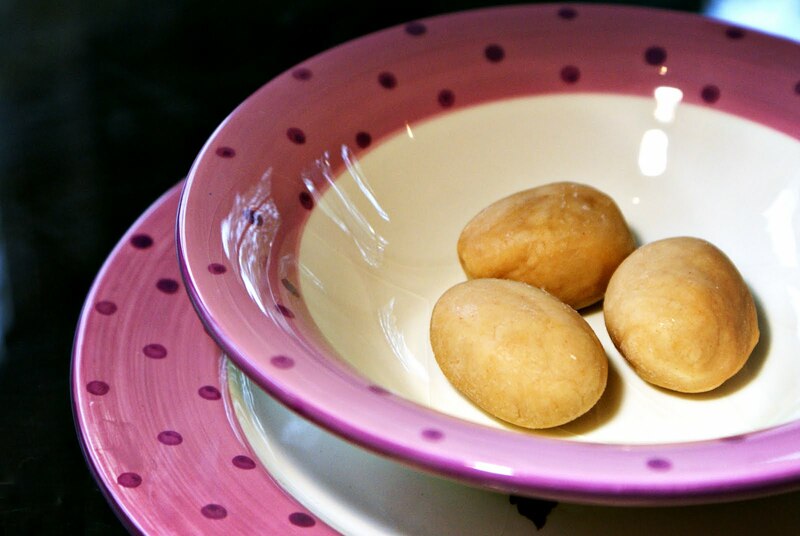 Using your hands, shape dough into small balls or egg shapes. 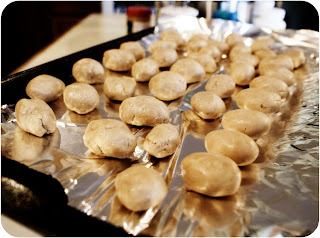 Arrange on a cookie sheet lined with wax paper and freeze until firm. Once firm, you can decorate with chocolate or transfer to an air tight container. I like to keep mine in the freezer because they stay firm but never get solid. They look like a bunch of stones on a cookie sheet. These look so yummy! I may try these! Oh my word! This sounds so amazing, I must try it. Peanut butter is pretty much my most favorite food. Do you think this could work with crunchy peanut butter? Either way, I am definitely going to be making this. P.S. I love your cooking posts. You give me great inspiration.